As of the 2000 census, there were 18,343 people, 7,497 households, and 5,337 families residing in the county. The population density was 168 people per square mile (65/km²). There were 7,937 housing units at an average density of 73 per square mile (28/km²). The racial makeup of the county was 90.26% White, 0.37% Black or African American, 0.58% Native American, 3.78% Asian, 0.03% Pacific Islander, 2.70% from other races, and 2.28% from two or more races. 11.75% of the population were Hispanic or Latino of any race. In the county, the population was spread out with 25.80% under the age of 18, 4.40% from 18 to 24, 27.70% from 25 to 44, 30.00% from 45 to 64, and 12.10% who were 65 years of age or older. The median age was 41 years. For every 100 females there were 101.40 males. For every 100 females age 18 and over, there were 99.70 males. As of the 2010 census, there were 17,950 people, 7,663 households, and 5,199 families residing in the county. The population density was 164.4 inhabitants per square mile (63.5/km2). There were 8,354 housing units at an average density of 76.5 per square mile (29.5/km2). The racial makeup of the county was 87.8% white, 6.0% Asian, 0.8% American Indian, 0.6% black or African American, 0.1% Pacific islander, 2.2% from other races, and 2.6% from two or more races. Those of Hispanic or Latino origin made up 14.7% of the population. In terms of ancestry, 18.9% were German, 16.5% were English, 13.2% were Irish, and 6.5% were American. The median income for a household in the county was $103,643 and the median income for a family was $118,993. Males had a median income of $93,040 versus $51,753 for females. The per capita income for the county was $49,474. About 1.4% of families and 2.4% of the population were below the poverty line, including 1.8% of those under age 18 and 2.4% of those age 65 or over. In a study conducted by American City Business Journals in 2004, Los Alamos County topped the list as the best place to live in America in terms of quality of life. This was attributed to the high levels of job stability, income and education of Los Alamos residents, many of whom are employed as scientists and engineers at the Los Alamos National Laboratory. The county has one of the highest number of PhDs per capita and the 2011 median household income of $110,204 per year is the second highest among all the counties in the US. In per capita income, Los Alamos County ranks 1st in New Mexico and 7th in the United States, and has the second-lowest level of poverty in the United States, and the lowest level of child poverty. Other factors contributing to Los Alamos's high quality-of-life index were the access to affordable housing and short commuting times. Formerly solidly Republican, Los Alamos County has voted Democratic in the three most recent presidential elections. It has seen high percentages of third-party votes in years with major third-party candidates, such as with John B. Anderson in 1980, Ross Perot in 1992 and 1996, and Gary Johnson in 2012 and 2016. Los Alamos County was Gary Johnson's best county in the nation during the 2016 election. ^ a b "Table 1: 2011 Poverty and Median Income Estimates – Counties". Small Area Income and Poverty Estimates. U.S. Census Bureau. 2011. Archived from the original on October 10, 2013. ^ "DP03 SELECTED ECONOMIC CHARACTERISTICS – 2006–2010 American Community Survey 5-Year Estimates". United States Census Bureau. Retrieved 2016-01-24. 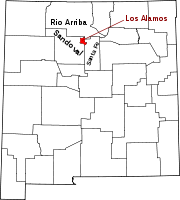 ^ "Los Alamos County Council". Los Alamos County Official County Web Site. losalamosnm.us. Retrieved June 9, 2017.